Plans have been announced to develop a new 3G playing surface on the grounds of Merville Community Centre. SPEAKER: FAI CEO John Delaney speaking at Merville Community Centre. The ambitious development will see the old tennis courts transformed into an all-weather training pitch which will provide Merville United’s many underage teams with first-class training facilities which will benefit their growth as players as well serving many others who use the centre. The announcement coincided with a visit from an FAI delegation on Monday morning who commenced their week-long stay in Sligo by making Merville the first of 20 local clubs they would visit ahead of Saturday’s AGM in the Clarion Hotel. Representing the FAI were CEO John Delaney, FAI President Tony Fitzgerald, U21 coach Noel King, Aine O’Gorman from the Senior Women’s team, former international Ray Houghton, FAI development officer and Sligo Rovers player John Russell and Longford Town’s Gary Shaw. Out on the Merville pitch the FAI delegation were treated to exhibition matches by many of Merville United’s players with Ray Houghton, Aine O’Gorman and Gary Shaw all getting involved. 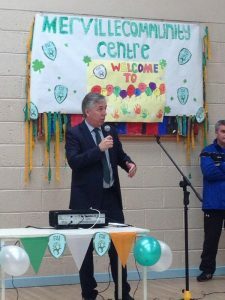 The football club has thanked the role played by the Merville Community Centre’s management committee and staff in supporting the project to date.